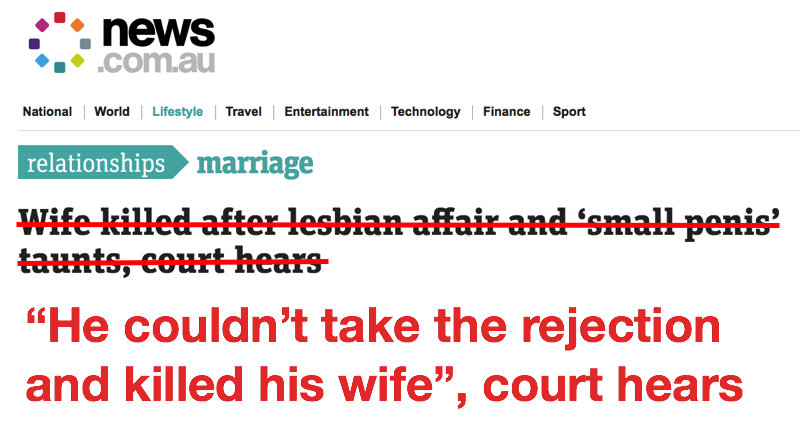 FixedIt: What did the court hear? Court reporting can be tricky. Journalists cannot include any commentary or opinion when they’re reporting on court proceedings. Such things could be prejudicial to the trial and possibly even result in a mistrial. Everyone suffers when that happens. It’s also difficult to cover an entire trial in one article. Murder trials can take weeks and journalists who report on the evidence given in one day can appear to be only giving one side of the story when all they are doing is reporting a single day of evidence. The people who write headlines, however, can choose which statement or piece of evidence they decide to lead with. This report, republished on news.com.au from the UK outlet The Sun, chose evidence that sensationalised the alleged murder of a 44 year old woman. A woman is dead and a man is on trial for murder. This is not a subject for salaciously scrabbling through the details of people’s lives. Doing so does huge disservice journalism, public understanding of violence and most importantly, to the lives of all the people affected by this woman’s death. David Clark denies the murder and the trial is ongoing.